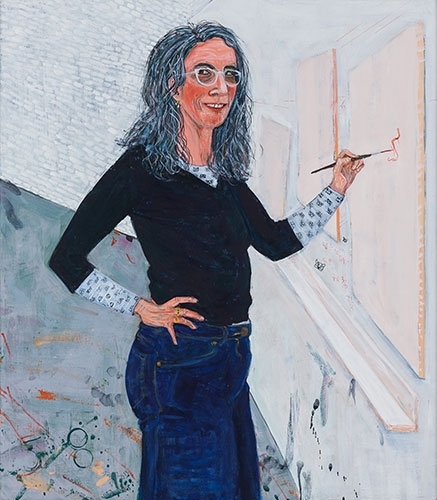 Sarah McEneaney's SP Studio, 2013 is included in the group exhibition About Face: Self Portraiture in Contemporary Art at the Hood Museum of Art. The work was acquired for the permanent collection of the Darmouth College museum after her last exhibition at the gallery, Trestletown. On view for the first time, the work is alongside self portraits by other leading contemporary practitioners including Chuck Close, Susanna Coffey, Rineke Dijkstra, Marit Følstad, Martin Gutierrez, Nikki S. Lee, Nomusa Makhubu, Bruce Nauman, Enrico Riley, Wendy Red Star, Cindy Sherman, Kiki Smith, Christian Thompson, and Jeff Wall. The work will be on view through August 30, 2015.